Did you know that the first ever breeder of the labradoodle species is from Leeds? So it only seems fitting that we’re home to one of the UK’s first dog-friendly cafes. While dogs have been welcome in various country pubs, it’s hard to find a completely family-friendly option for doglovers. So we were delighted to be invited to The Doghouse Cafe at the top of Yeadon High Street, along with our ten year old pug, Bridget. We are The Doghouse Cafe based in Yeadon near the airport. 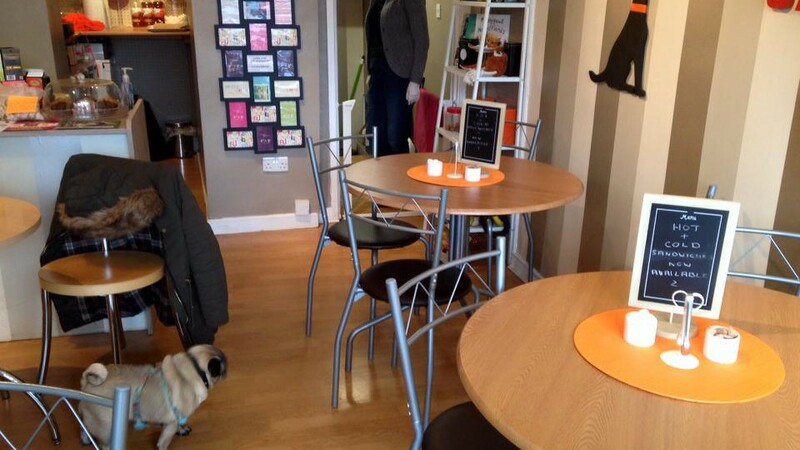 We opened in October 2014 as a new venture as a completely unique dog friendly cafe. I actually used to work in funeral services but an opportunity came up for us to set this up and off we went. I own cats (which people think is really funny!) but I love all animals, and wanted to create somewhere that canines could chill out with their owners. What do you think makes The Doghouse Cafe unique? We have friendly staff, great cakes, good coffee, a warm welcome assured, whatever the weather. Dog cafes would seem quite mad in other cultures where dogs are readily accepted into society, but in Britain they’re a rarity. What can customers expect from you? We’re primarily a coffee shop but we actively encourage dogs to be off the lead so they can play with other dogs. We offer toys, treats, water and towels for the more wet and muddy hounds. We’re right by Yeadon Tarn so we often get muddy visitors! A safety gate is installed for dog safety. We also offer one-to-one socialisation classes on an evening. What’s your favourite item on the menu? I love our lemon sponge cake (you can’t beat a classic!) which is £2. You can get pie and peas for just £1.80, or a firm favourite is our tasty Ploughman’s lunch for £3. Cheese on toast covered in thick cheddar or hot chocolate and marshmallows for those colder days. We always have a selection of fresh cakes which always go down well with a coffee. I was born here haha! It just is awesome. It’s very diverse. Where else would you find a doggy cafe?! Where do you like to hangout apart from your own cafe? I love Cafe Lento in Headingley for good food and live music and Richard, the owner, is lovely!